While such a question may strike the casual reader as esoteric enough to evoke the age-old lay challenge to all theological questions (viz., Who cares? ), the author, Rev. Dr. Kevin Giles, a long­term member of CBE and champion of biblical equality, argues that every historically orthodox Christian should certainly care, since "what we are in fact talking about in this study is eternal self-differentiation within the life of God in eternity" (24). In other words, for him, this doctrine "means that the Son is God in exactly the same way as the Father, but he is not the Father" (27), establishing that the Son was not merely created at the incarnation (as the neo-Platonist­influenced preacher, Arius, who saw the Son as a creation challenged the early church, "There was when [the Son] was not"). Instead, for Giles, the doctrine of the eternal generation teaches that the Son is eternally connected to the Father in the Godhead, revealing equality of substance (as the defenders of the Creed of Nicaea argued), but also distinction, making this doctrine nothing less than a defense of Trinitarian orthodoxy itself. Of course, Professor Giles understands, as he notes, "Today, some of the best known names in the evangelical world advocate the abandonment of the doctrine of the eternal begetting, or generation, of the Son" (30), basically, because opponents contend "these words have no biblical warrant," and, since "'all we believe comes directly from the Bible,' the claim that the eternal begetting of the Son has no biblical grounding is a compelling reason why the words should indeed be set aside" (25). But, we should also note, some of the hesitation with current evangelicals is also over whether the Bible should be read first by itself or initially through the universally accepted creeds, which, though widely affirmed, are not themselves canonical Scripture. This division of approach can be found between the heirs of the more radical Reformational churches, such as congregational, Baptist, Pentecostal, and lower-church Presbyterian, and the Anglicans, Episcopalians, some higher-church Presbyterians, and others. To the Anglican priest Kevin Giles, "However, the deletion of these words from the creed is a momentous step with huge consequences," since, in his view, "to cut out these words from this ecumenical creed is to cut oneself off from the belief of millions of Christians past and present who have confessed Jesus Christ as 'eternally begotten of the Father.' It is to break with historic orthodoxy, to move outside the catholic church, and a community that decides to do this becomes a sect." Giles cites Timothy Larsen's charge that "to reject all or part of the Nicene Creed is even to put oneself outside of the evangelical community of faith" (25-26). Now, these are serious charges, indeed, for a doctrine that was presented to the Council of Nicaea in AD 325 by the early church historian, Eusebius, who was himself a semi-Arian, as part of the creed of the church he presided over at Caesarea. The doctrine was not adopted for inclusion in the creed of Nicaea by the Nicaean delegates. Later, according to historian Henry Bettenson, it was included in "a revision of the Creed of Jerusalem held by Cyril" ("as many believe"), becoming "the Constantinopolitan, or Nicaeno-Constantinopolitan creed," which 126 years later was presented at the council at Chalcedon in 451 as "the creed (of the 318 fathers who met at Nicaea and that of the 150 who met at a later time" (i.e., at Constantinople, 381), thereby being dubbed the "Nicene" creed 1 and replacing the actual historic Creed of Nicaea. The very early theologian Origen, whose thought was later ruled heterodox, in his commentary on the Gospel of John, claimed that the Son derives deity from the Father (having "drawn divinity into himself") and would cease to be divine if disconnected ("he would not remain God if he did not continue in unceasing contemplation of the depth of the Father").2 Origen was a zealous proponent of "an eternal and everlasting begetting. "3 Hesitation with such an interpretation may have accounted as heavily then as now for the rejection of this doctrine. To many evangelicals today, such a reading might make the Father appear to be the primary ingenerate deity out of which the Son and the Holy Spirit emerge eternally, thereby making the Son and Spirit secondary and tertiary gods. Kevin Giles is totally opposed to such a radically subordinationist reading and utterly rejects the notion that the doctrine teaches any subordination in the Godhead at all, but contends it teaches exactly the opposite. As he explains: "The more common evangelical opinion that the doctrine of the eternal generation of the Son implies or necessitates the eternal subordination of the Son in role and authority, not his ontological subordination, has nothing to commend it. This verbal distinction makes little or no difference. 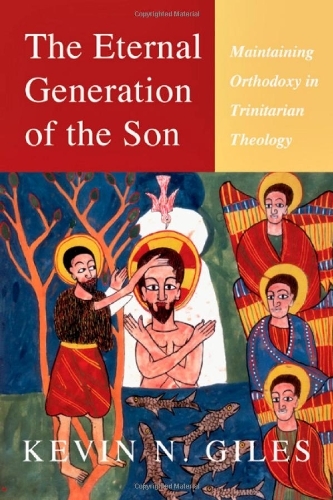 A necessary and eternal subordination of the Son in role and authority in the immanent Trinity implies the ontological subordination of the Son" (211-12). And here he cites Millard Erickson and others as well. One cannot make a statement more clearly than that, and his entire book is a careful exposition from the early church to the Reformation and Post-Reformation to the present day with copious examples to defend this doctrine as ensuring full equality in every aspect of the Godhead. In essence, this is an important book, well thought through and passionately argued. Those who already accept this doctrine will be given reason for the hope that is in them, and those of us who question it will find provocative food for thought, as Giles skillfully seeks to set aside apprehensions that this doctrine undermines the equality of the persons of the Trinity, assuring us that it is not teaching any hierarchy at all in the Trinity, but the point of it is to demonstrate that Jesus Christ is fully God (along with being fully human), equal with, but differentiated from, the Father. In short, I heartily commend this book to all CBE readers. One does not have to be a professional theologian to want to know more about the nature of God and the history of the church's struggle to understand what God has revealed about Godself. In a day of cerebral junk food, spoon-fed us in instantly messaged pop theology, it is salutary to have thoroughly evangelical books that nourish us like a five course meal—scholarly, yes, but written with the passion of real conviction, unflagging commitment to a high view of Scripture, and a deep and devoted love for God. 1. Henry Bettenson, ed., Documents of the Christian Church, 2nd ed. (New York, NY: Oxford, 1963), 24-26. 2. Origen, Commentary on the Gospel According to John, Books 1-10, trans. Ronald E. Heine (Washington, DC: Catholic University of America Press. 1989), 99 (2:17-18). 3. Origen is careful to note, "It is impious and shocking to regard God the Father in the begetting of his only-begotten Son and in the Son's subsistence as being similar to any human being or other animal in the act of begetting; but there must needs be some exceptional process, worthy of God, to which we can find no comparison whatever, not merely in things, but even in thought and imagination, such that by its aid human thought could apprehend how the unbegotten God becomes Father of the only-begotten Son. This is an eternal and everlasting begetting, as brightness is begotten from light. For he does not become Son in an external way through the adoption of the Spirit, but is Son by nature." Origen, On First Principles, trans. G.W. Butterworth (New York, NY: Harper and Row, 1966), 17-18 (2:4).